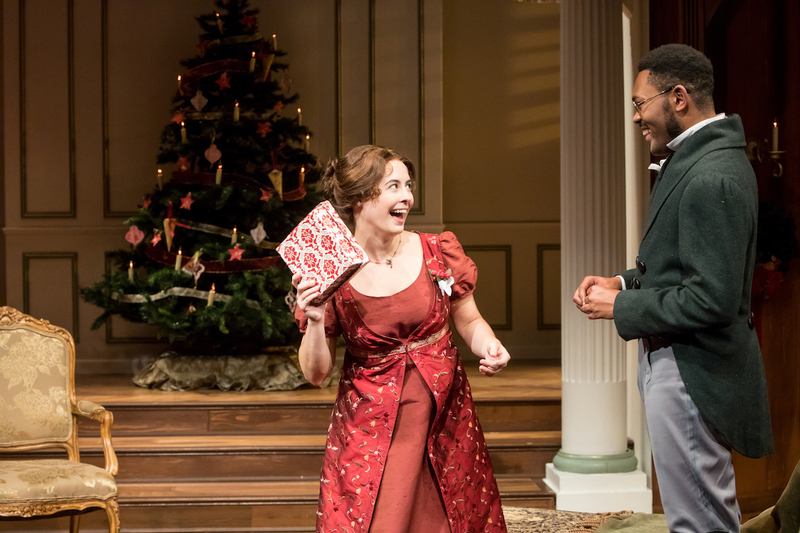 If you are searching for a fun and festive holiday farce, I recommend wholeheartedly Miss Bennet: Christmas at Pemberley at the Jungle Theater now through December 30. This adorable and funny Georgian-era play answers the burning question among Jane Austen fans: Would Mary Bennet (Christian Bardin) find love or would she remain the awkward, spinster sister? You don’t have to be a Jane Austen fan to enjoy this family-friendly play–it hits all the right notes with witty banter, blossoming romance, wonderful performances and Christmas cheer. This imagined sequel to Pride and Prejudice picks up two years after the book ends, centering on Mary, the awkward and lost middle daughter who is now alone in caring for the Bennet parents. Older sisters Lizzie (Sun Mee Chomet) and Jane (Adia Morris) are happily married and younger sister Lydia (Kelsey Didion) is in denial over her struggling marriage to Wickham. They reunite at Darcy’s Pemberley estate for Christmas and fuss over the newly introduced German tradition of bringing indoors and decorating a pine tree. Mary is the heroine in this story and, unlike in Pride and Prejudice, has uncovered her own passions for reading, learning and playing the piano independently from her sisters. What Jane Austen fan hasn’t wondered if Mary would become a fully realized woman if she weren’t overshadowed by her sisters? In this play, Mary is still painfully self-aware, but is stronger and better able to assert her own personality in competition with her sisters and their husbands. When Mary unexpectedly encounters shy bookworm Arthur de Bourgh (JuCoby Johnson), she finds a kindred spirit and intellectual equal. Arthur is the nephew of the formidable Catherine de Bourgh who, as her nephew and male heir, inherits the estate after her death. Darcy (James Rodriguez) invites cousin Arthur to Pemberly for Christmas and the plot revolves around Mary and Arthur’s romantic encounters, misunderstandings arising from the unexpected appearance of Anne de Bourgh (Anna Hickey), Lydia’s cluelessness and the Darcy, Bingley (Sam Bardwell) attempts to encourage Arthur’s romantic overtures. November 22, 2017 in Jungle Theater, Reviews.